Whalebone smoothing boards have been found mostly from western Norway (40 finds), and occasionally elsewhere (Roesdahl and Wilson 1992, Fitzhugh and Ward 2000). Four were found at Birka, one in a grave and three in the Black Earth (Andersson 2003). Three were found in Britain (MacGregor 1985). The Swedish and English finds were probably imported from Norway, where whalebone was most common (Roesdahl and Wilson 1992). 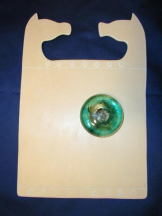 Smoothing boards were usually found in rich female graves, and may have been a prestige item (MacGregor 1985). The most common pattern has confronted animal heads at the top, but the execution ranges from rudimentary to well-developed and ornamented (MacGregor 1985). The Norwegian smoothing board in Fig. 1 has been widely pictured in various sources. It was found in a 9-10th c. grave in Norway, and is 34.5 cm in height (Fitzhugh and Ward 2000). 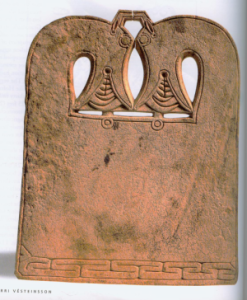 The second board (Fig.2) was found in a female grave at Birka, and is the only board found with a linen smoother. It is slightly larger, 35.5 cm in height, 24.5 cm in width and 1.8 - 2.3 cm thick (Arbman 1940-43). Figure 1. Whalebone smoothing board from Norway. Height is 34.5 cm (Fitzhugh and Ward 2000). Figure 2. 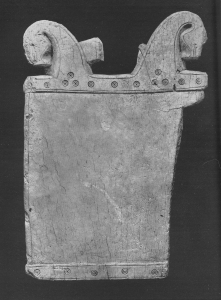 Whalebone smoothing board from Birka. Height is 35.5 cm (Arbman 1940-43). The glass linen smoother, or slickstone, is included here as a display item. Similar items were in use until the 19th century to smooth linen and to press pleats (Roesdahl and Wilson 1992). Most of the early examples are of dark green glass, colored by the impurities in the sand they were made from (Charleston 1990). This one was made for me by the Penn State Glassblowing Lab, based on documentation I provided on similar artifacts from Birka. The countersunk pit where the smoother was separated from the maker's rod is characteristic (Charleston 1990). Glass smoothers or fragments are known from female graves throughout the Viking region, including Anglo-Scandinavian York, Winchester and Birka (MacGregor 1976, Charleston 1990, Fitzhugh and Ward 2000, Mainman and Rogers 2000, Andersson 2003). They were probably imported from the continent rather than locally manufactured (Fitzhugh and Ward 2000). The example in Fig. 1 is 8 cm in diameter, and was found in Norway. Glass smoothers were mainly 6.5 - 8.5 cm in diameter (Charleston 1990, Roesdahl and Wilson 1992), a comfortable size to hold in the hand. They were especially effective on linen because it can be pleated and pressed cold as long as it is damp. This may be more useful for making the linen shiny than for making it wrinkle-free, as linen tends to wrinkle as soon as worn. Cetacean bone was widely used in northern Europe for a variety of implements. Whaling began by the 6th c., and before that whalebone was available from occasional strandings (MacGregor 1985). Since whalebone is no longer readily available, I decided to use laminated paper embedded in phenolic resin (e.g. micarta) as a substitute. Micarta is commonly used by artisans to simulate bone and ivory. I do not know what color fresh whalebone is, so I color-matched the micarta to the aged whalebone of the 1000-year-old smoothing board in Fig. 1. Bone yellows with time, and I thought that color would be more representative of a frequently-used tool than white would be. The micarta I chose is 0.5 mm thick; it wasn't until after I had ordered it that I found the Birka reference which gives the thickness of that board as around 2 cm. I examined various Scandinavian items, especially bone combs, while working out the design for this board (e.g. In Arbman 1940-43, MacGregor 1985). Confronted animal heads are a common design, and I like them, so that was an easy choice. I modeled these loosely after the end-pieces on a silver armring from Birka (Fig. 3). The circle-and-dot motif is also extremely common on bone items and generally in Viking art. I generally patterned the design after the two boards illustrated above. During the Viking era bone working was carried out with a variety of tools, including saws, lathes, files, knives and draw-knives (MacGregor 1976, 1985, Biddle 1990). Incised decoration was applied using a knife, and probably not with a chisel. The ubiquitous Viking circle-dot motif was created with a scriber. Bone items were smoothed and polished with files and knives, and pumice was used to smooth and polish. Micarta is considerably denser and harder to work than bone, so I used power tools for the early shaping steps. While the rectangle was cut out with a hacksaw, the heads were cut and shaped with a Dremel. The straight lines were cut with a Dremel, but I now wish I had done them by hand because a graver can be run along a straight edge, but a Dremel can't, and my straight lines aren't. The circle-and-dot motifs were put in using an electric drill and a scriber cut down from a spade bit. The shiny surface of the micarta was taken off using a flap wheel on the electric drill. The finish work was done by hand. Edges were rounded with a file, and the entire board was sanded, then finished by rubbing with a damp rag dipped in pumice to give a final surface similar to that available with Viking-era methods. The function of the glass linen smoother is well-known, since they were used to smooth textiles and press pleats until the 19th century, and are well-documented both physically and in textual sources. The boards are more problematic, since only one of the 40 known was found with a glass linen smoother (Roesdahl and Wilson 1992). Because heat is not involved, nearly any flat surface would work for smoothing linen. If the boards were not found with linen smoothers, even though smoothers were so abundant in the archaeological material, what were they used for? Now that I have one to experiment with, hopefully I will be able to develop a plausible hypothesis. Some initial experimentation shows that polishing cool damp linen does make it smooth and shiny, and that the smoothing board and smoother put in nice pleats. The board is a very convenient size for holding in your lap while you work. A smooth piece of wood of a similar size would probably work just as well. Biddle, Martin. 1990. The nature and chronology of bone, antler, and horn working in Winchester. Pp. 252-264 in: Biddle, Martin. Object and Economy in Medieval Winchester. Oxford University Press. Charleston, R.J. 1990. Slick-stones ('linen smoothers'). Pp. 240-242 in: Biddle, Martin. Object and Economy in Medieval Winchester. Oxford University Press. Fitzhugh, William W. and Elisabeth I. Ward (eds). 2000. Vikings: The North Atlantic Saga. Smithsonian Institution Press, Washington DC.